Let’s face it. Fees are lame. Most auto and motorcycle dealerships employ a shifty method of advertising a fake price then padding it with additional charges for such ludicrous things as “freight and set up”, “dealer handling” and “documentation fees”. These are all normal costs of doing business and it’s our feeling that honest sellers will simply tell you want they want for a vehicle. At Sportique Scooters the only fee a buyer will encounter is good old fashioned sales tax and we would eliminate that, too, if we could. The way we see it an $.89 can of green beans is just that. The grocery store doesn’t add another nine cents to compensate them for going to the trouble of selling green beans. That would be ridiculous, right? Unfortunately, our industry is so entrenched in the fee model that manufacturers set suggested retail prices assuming that the dealer will add fees – that’s why MSRP is almost always followed by an asterisk. 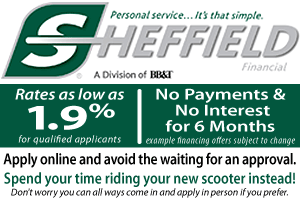 For that reason our prices on new scooters are often slightly higher than MSRP so that we can earn a fair margin the honest way.